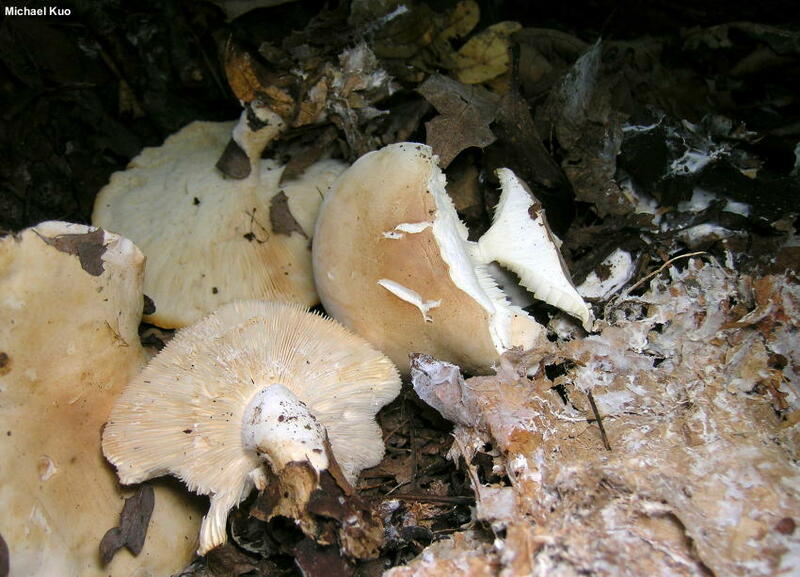 Leucopaxillus laterarius decomposes leaf litter in eastern North America's hardwood forests. 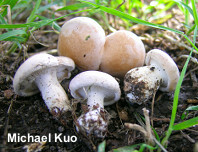 Its physical features are virtually inseparable from those of the conifer-loving Leucopaxillus albissimus, though the latter species is usually a little stockier, has slightly less crowded gills, and usually features less pink in the cap color (when pigments are present; both species are frequently white). Spore size may be a more reliable separator (the spores of Leucopaxillus laterarius are almost always under 5.5 µm long), but confusing laterarius-or-albissimus specimens should be expected if you are unwilling to accept my hardwood-conifer species division. 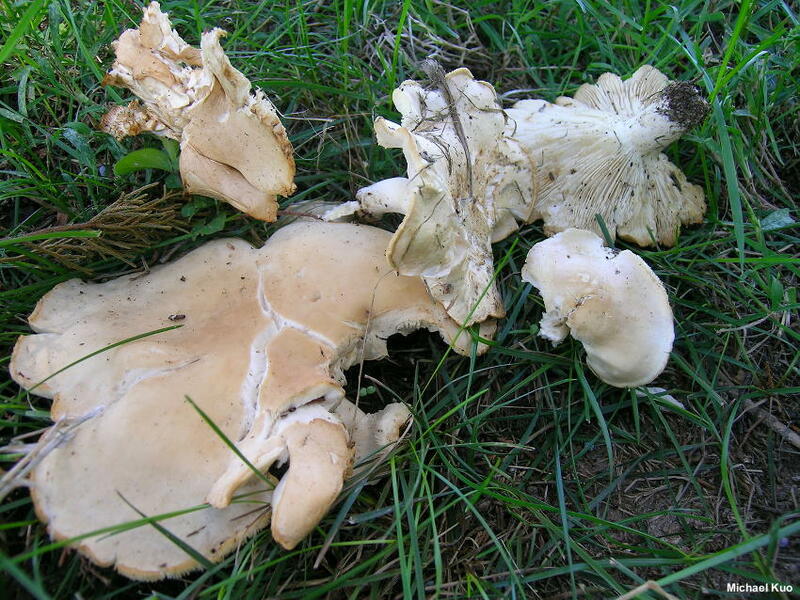 Ecology: Saprobic, decomposing the litter of hardwoods in oak and beech forests; growing scattered or gregariously; frequently appearing in early summer, but also common in late summer and fall; widely distributed in eastern North America. The illustrated and described collections are from Illinois. Cap: 3–12 cm; convex with an inrolled margin when young, becoming broadly convex or nearly flat; dry; bald or very finely velvety (like kid leather); whitish to pale tan. Gills: Broadly attached to the stem or beginning to run down it; close or nearly crowded; separable from the cap as a layer; short-gills frequent; whitish, sometimes becoming dirty yellowish when mature. 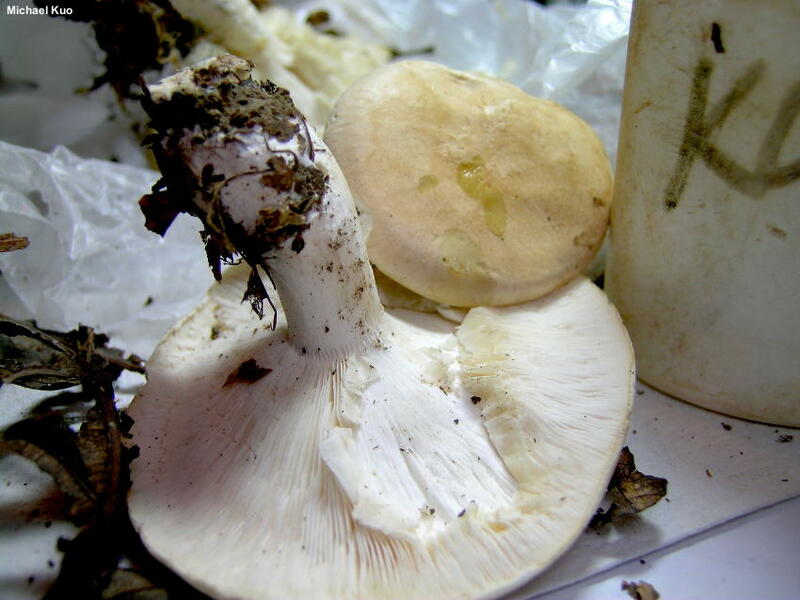 Stem: 4–7 cm long; 1–1.5 cm thick at the apex; when young often swollen near the base but by maturity usually more or less equal; bald or very finely fuzzy; whitish, discoloring brownish with age; with prominent and copious white basal mycelium. Odor and Taste: Odor mealy or foul (like coal tar or swamp gas). Chemical Reactions: KOH dull olive on cap surface. 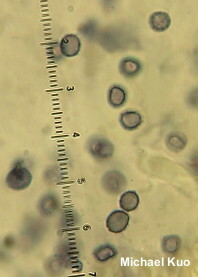 Microscopic Features: Spores 3.5–5.5 x 3–4 µm (including ornamentation); broadly ellipsoid to subglobose; finely spiny with spines under 0.5 µm high; amyloid. Basidia 4-spored. Cheilocystidia 25–35 x 2.5 µm; cylindric-flexuous; smooth; hyaline in KOH. Pleurocystidia not found. Pileipellis a cutis of smooth elements 2.5–5 µm wide; hyaline to yellowish in KOH. REFERENCES: (Peck, 1873) Singer & Smith, 1943. (Singer & Smith, 1943; Smith, Smith & Weber, 1979; McKnight & McKnight, 1987; Miller & Miller, 2006; Kuo & Methven, 2014.) Herb. Kuo 09200602, 09200603, 09230602.